Delicious clusters of puffed rice, sunflower seeds, pepitas and teff seeds. Crafted with rich flavours of Pear, Almond & Vanilla Bean. 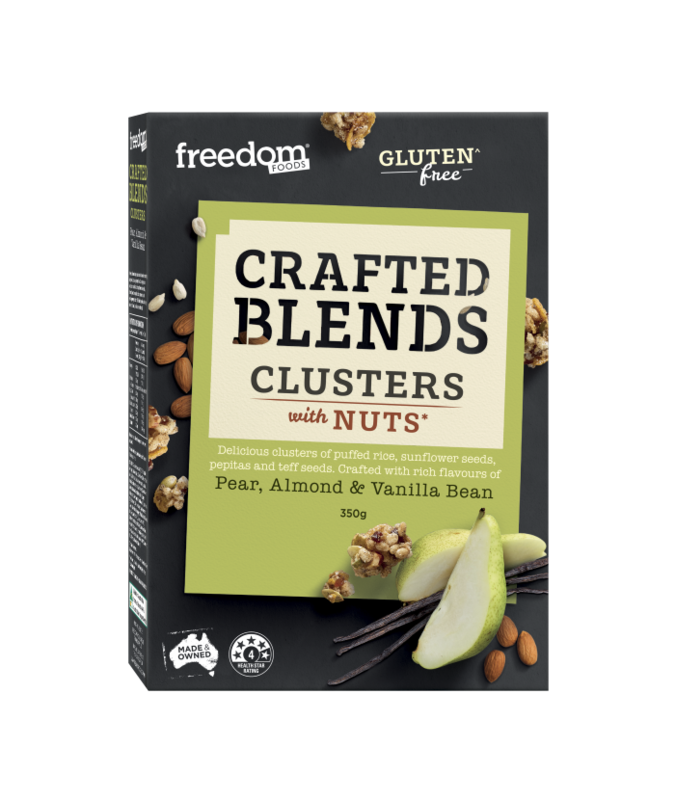 Freedom Foods are passionate about ensuring our products are gluten free. Our rigorous process includes testing of raw materials, throughout the production process, and testing every batch of finished product using internationally validated methods. Product manufactured in our VIC facility and may contain milk, peanuts and sesame seeds. * Contains Soy and Tree Nuts. ^ Free from gluten as found in Wheat, Rye, Barley and Triticale. The product is made with non GMO ingredients. From time to time we make improvements to our recipes, which may result in changes to the ingredients list and/or allergy advice from that stated on this site. We always update our packaging to ensure it is accurate and aim to keep this website updated with the latest information about our products. For this reason we are unable to accept liability for any incorrect information on this site. If in doubt, we advise our customers to read the label on the pack before eating our products and never rely solely on the information presented on this website. If you require specific advice on any Freedom Foods product, please contact our Customer Service team on 1800 646 231 where we will be happy to answer your questions. Gluten Free Cereals (42%) (Puffed Rice (Rice Flour, Sugar, Salt, Golden Syrup), Rice Flakes (Rice Flour, Maize Flour, Psyllium Husk, Apple Juice Concentrate, Sugar, Salt, Emulsifier [Sunflower Lecithin], Sunflower Oil)), Corn Flakes (Corn Flour, Resistant Dextrin [Prebiotic Fibre], Sugar, Maltodextrin, Golden Syrup, Salt, Sunflower Oil)), Pear Pieces (12%) (Pear Puree (6.8%), Invert Sugar, Sugar, Humectant [Glycerol], Citrus Fibre, Gelling Agent [Pectin], Natural Flavour, Acidity Regulator [Citric Acid]), Glucose, Seeds (11%) (Sunflower Seeds, Pepitas, Teff Seeds), Chicory Root Fibre, Almonds (6%), Sunflower Oil, Brown Rice Syrup, Modified Starch (Tapioca Dextrin), Vanilla Bean Seeds (0.5%), Cinnamon, Natural Flavour, Antioxidant (Vitamin E). Take the journey with us and let your taste buds discover our delicious new range from our facility in Dandenong, Victoria. Oven baked crunchy clusters (YUM), carefully crafted using a select blend of nutritious almonds and seeds (sooo good for you!) wrapped up using rich flavours, they’re sure to bring joy to your mornings. How we like them – rise and shine to a mouth watering bowl topped with fresh fruit, add it to yoghurt, or savour the crunch when you just feel like a snack. So lovely! Nourishing, filling but fresh and light. Beautiful flavour. Highly recommended. At Arnold’s Farm, we believe that good food should be celebrated. That’s why for over 30 years, our team have been dedicated to sourcing the finest ingredients to create delicious and wholesome food, so you can enjoy a little bit of indulgence every day. Our creamy Traditional Oats are the perfect base for your porridge, overnight oats, or even a hit of protein in your smoothie. 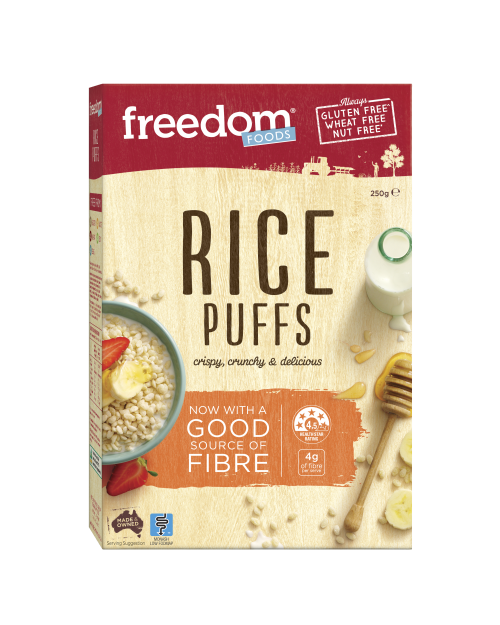 A good source of fibre and gluten free – these aren’t your regular supermarket puffs.